Anonymous, 22 Mar 2014So in other words you are just another jealous hater? Did you even read the article showing t... moreNote held advantage in the eyes of GSMARENA Arena only. I am using Note 3 and Lumia 925. Lumia is very close to IOS performance wise. No stutters no lags no freezing. Despite of heavy specs on Note 3 it still lags, and stutters. S Pen is useful but not in all situations. And android? You all know. Google just cooks everything whether it is good in taste or not dies not matter. 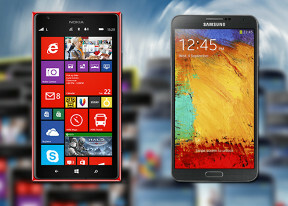 Ios and windows 8 have less features but add value and comfort to everyday use. Perez, 14 Jun 2014When you say all phones hang, it goes to show the that you've never used a lumia device. Bro, ... more"Bro, lumia does hang." You are exactly right. Thank you. Ur comment is more boring than ever. Anonymous, 06 May 2014The probably really comes down to APPS. and the Windows app store offers hardly anything wor... moreSomeone posted that he won't buy a lumia device cos there was no game like real racing 3. I just wonder what are the reasons someone will buy an expensive smart phone just to play real racing 3. Save yourself some bucks but a Nintendo handheld game. Anonymous, 13 Feb 2014All phones hang. When you say all phones hang, it goes to show the that you've never used a lumia device. Bro, lumia does hang. The OS is solid and stable period. Nick, 03 Jun 2014There are sooooo many customizing apps with windows phones. Transparent tiles, custom tile mak... moreThat's about the extent of it.....And from the looks of their comment they probably already knew what you said. ddroid45, 26 Feb 2014Lumia 1520, one heck of a phablet, only problem is, it's Windows OS, boring tiles, no real cus... moreThere are sooooo many customizing apps with windows phones. Transparent tiles, custom tile maker, just Google it up. Akash, 12 May 2014nokia lumia 1520 is the best because of its colours ,size,camera and sound capture techlogy.Colors is preference. Many people like the look and feel of the Note. It's display is top notch. The much lesser camera of the Note 3 actually has overall more advantage. And yes the while audio is great on both Nokia has the upper hand in mics. nokia lumia 1520 is the best because of its colours ,size,camera and sound capture techlogy. The probably really comes down to APPS. and the Windows app store offers hardly anything worthwhile. Go and do a search. It is hard to find quality games - look up Real Racing 3 - a great game - its not there. Real Racing 2 is...for $4.99! Really??? Youtube...nope, not there either. How about Madden or NBA games. Nope. Instagram? Nope. Until windows comes out with much better apps it doesnt matter how great the phone operates. And I want the Nokia - i really do, but I cant justify buying it to have a good camera. I need a good phone! AnonD-78217, 28 Apr 2014I recently got myself an 1520 to go along with my S4, upgraded it to WP8.1 Prv, and I think it... moreIn all fairness you are comparing a device which ones on an OS that is very much more restricted and less capable which in turn makes it a little smoother...Not by miles...and that has an S800 chip on top of that to a phone you control and tell what to do with many more options than even the rest of the crowd on an S600. An S801 compared to that would even be more fair. Or at least another S800. Like the Note 3 since you are talking phablet. I would spend time with the Note 3 before making that decision......But that's just my logic. I recently got myself an 1520 to go along with my S4, upgraded it to WP8.1 Prv, and I think it is probably the best phone/phablet I've owned. Very good battery life, rock solid stability with good performance in almost all areas, which unfortunately not the forte of Android (mainly due to customizations I guess). I am now seriously considering ditching my second phone i.e. S4(i9505) for a Lumia device probably by end of the year. Dhamu, 26 Apr 2014Sony,samsunng and etc company depand on google. If google had not supported to those company t... moreRegardless of whether Nokia is NOW part of Microsoft or not does not change the fact that it is the EXACT same situation. Nokia depends on Microsoft. Point invalid. A couple years ago when Symbian still had some life was different. android has gotten stale. just like apple has been stale for 5+ years, android hasn't changed much in 2 years. ditched my galaxy tab2 for a asus transformer with win8.1 pro and am loving it. im using a note 3 now, which is a great phone, but i'm left wondering is the next flagship windows phone the one I switch to. my only holdback is the RT, give me a phone with win8 pro, and i'd be all over it. Marz, 16 Feb 2014I've used android for last 3 years.initially it was really amazing and play full.But later I c... moreYou are right!!!... i have also the same opinion. i been lumia since day one.